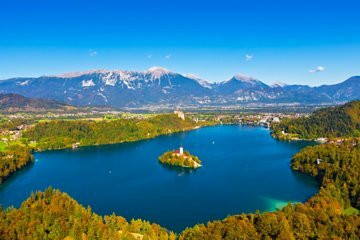 Enjoy the pristine Slovenian countryside during this all-day guided tour of Bled and the Bohinj Valley departing from Ljubljana. Surrounded by majestic mountains, Lake Bled seems like it’s drawn from a fairytale. 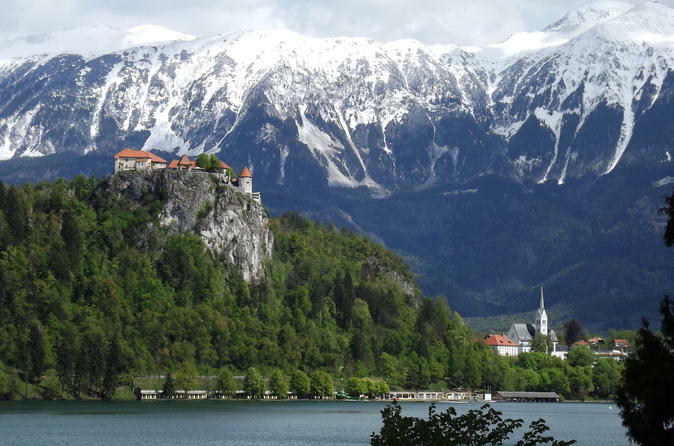 During this tour you will visit the 11th century Bled Castle set high atop a cliff and then head to Bled Island. The tour finishes with a visit to the Bohinj glacier lake, the largest lake in Slovenia. Following a convenient pick-up at your central Ljubljana hotel, meet your guide and head to Bled Castle. Learn about the medieval castle’s history during your guided tour. Next, journey through rural Slovenia to Bohinj Lake. Capture spectacular turquoise views of Slovenia’s largest glacial lake and the surrounding Julian Alps. In the distance, witness the 9.396-foot (2,864 meter) Slovene peak of Mt.Triglav, the highest point in Slovenia. Then take a short 15-minute stroll to the the origin of Bohinj Lake, the emerald green Sava Bohinjka River. Enjoy a chance to rest and soak up the ambience. Finally, visit the Church of St. John the Baptist on the northern side of the Sava Bohinjka River and enjoy its exquisite 13th century frescoes. Hop back on the bus and journey home to Ljubljana. Barbara was so lovely and informative! We learnt do much and got to explore so much of beautiful Slovenia. The tour was small and intimate so could ask plenty of questions and get lots of photos. We all had an amazing day! Tour was outstanding minus our guide. This tour packs a lot into one day but is truly beautiful and a great way to experience the Julian Alps for the day. The downside was Ziga, our guide, who was basically silent the whole trip. I was really looking forward to hearing rich stories, anecdotes, and more than just the wikipedia page results/awkward one-liner facts about Slovenia. Ziga was uninspired, tired?, and is just not suited for the tour guide profession. He was a great driver and pointed us to a great restaurant though. Highly recommend this tour if you get one of the other guides in the reviews - sounds like there are lots of good ones.  Request someone else by name. Barbara was amazing! We were met with unexpected rain and she worked to accommodate the situation and made the day so enjoyable. Her knowledge of Slovenia and the Bled/Bohinj area was very impressive. We really loved the tour! A wonderful day! We walked up to see the scenic Savica waterfall, toured through the most beautiful Bohinj Valley and visited Lake Bled and Bled Castle. Our guide, Vladimir, was very knowledgeable and thoughtful, with a very quirky sense of humour. We really enjoyed our time with him. This tour was perfect! We saw and experienced so much and didn't feel rushed. All the stops were beautiful and our group was small. Definitely book this tour!